Youve Been Reviewed: When it comes to reviews….who do you believe? When it comes to reviews….who do you believe? Who , how much or what do you believe when it comes to reviews, that is the question. I imagine you have been there – you are going on vacation and anxiously deciding which restaurant you will try first – they all sound so good! I am going through that right now regarding our upcoming trip to Murphy, NC. It’s a few months down the road, but rentals book fast, especially when you need pet friendly. The rental is set so I requested information from the Chamber of Commerce. I immediately looked at the page with Restaurant Information…I thought any of those listed would be amazing and if they are in the Chamber’s packet of tourist info they must be good right? Maybe, maybe not! I have checked out most of those against reviews from various sources and while the ads may claim they are ‘the best’, customers don’t always agree. What do you do then, who do you believe? That is an age-old question that will always be asked. There is a Chinese Buffet that claims to be the best of the best, yet so far, the reviews I’ve found don’t agree with that. Since there are far more bad reviews than good ones, I don’t think we will be eating Chinese! J. Arthur's Restaurants, Maggie Valley, NC - I highly recommend the prime rib! You have to take a step back, read the reviews and come to your own determination. You could also ask the locals for their thoughts. Hopefully the locals to the area will be more than glad to steer you in the right direction. I have no fear of asking strangers who live near the rental what they recommend. The rental we will be taking is through a rental agency located in another state so I am not sure asking the lady from the agency would be productive. I can ask just to see if my theory works or not! It’s a toss-up for sure and I don’t want to continue to agonize over this. The other thing to consider is that you and I won’t like the same things….you might love a blood red burger the way “Burgers Are Me” cooks them and give them a rave review. For me that would be a turn off. On any given day food can be a little ‘off’…the chef has a bad day; the lettuce is a little wilted or any other number of reasons. You can find the same issues in your favorite ‘home-town’ place too. 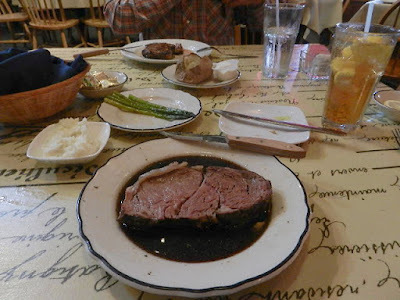 Last year we had a trip planned to Maggie Valley, NC and I searched for all the restaurants and found several that were on our ‘to-eat-at’ list. The first night there we searched and searched for a particular seafood place. Up and down the road we went several times and could not find it. I had just printed out the menu from their website the week prior. Finally, we stopped at the rescue squad building and I asked about the restaurant. It closed the week before. So, if you plan on visiting particular restaurants or venues, be sure to double check that they are still open!! Food at an unfamiliar restaurant is oftentimes a situation where you just go for it and hope for the best. You might be surprised! I am hoping that it turns out good for you and good for us!